24.25 x 96 in. Back Wall Replacement Graphics: Replacement graphic for the connector panel that joins two 10 foot Perfect 10 displays to make a 20 foot booth. In the online trade show display business, the function of truly serving our clients is a crucial function that can't be ignored. All of us as service professionals, have to be willing to work harder to ask questions pro actively in order to understand what the client's goals are for the display they're purchasing and not become order takers and processors. Even though time sometimes runs out, we have to be prepared to step back and take the time to walk our clients through their purchases, which will create the good will that will continually bring them back over and over. Our goal at ShopForExhibits is to guide our clients so their exhibiting experience will be as valuable as possible to both them and their company. 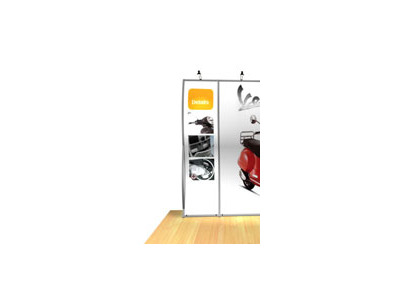 Very few things in life are quite as sure as change, which is why having a trade show display supplier like Classic Exhibits has enabled so many distributors weather the tough times through the development of so many new cutting edge products. What steps did they take to succeed in a time where little new innovation was coming out in the trade show exhibit industry? Classic observed that there were several shapes of aluminum extrusions that that they already purchased that gave them an exceptionally large amount of linear footage per dollar when compared to others. With the help of a innovative staff and a solid vision of the future, they've been able to bring to market, a number of well received new lines of custom modular hybrid displays. Some of the more impressive product lines that were developed during this time frame were the patented Perfect 10 replacement graphics, Magellan Miracle, and the Sacagawea custom modular hybrid displays; all illustrations of the new surge of tension fabric displays in the trade show market. Right now, Classic is being very assertive in the market in comparison with other manufacturers of trade show displays, which has put them in a leadership position where they will be well equipped to be a market leader as they head into the future.